Magic Blackout Blind ™ - The only blackout blinds guaranteed to stop all light - even around window edges. Magic Blackout Blind ™ is quick and easy to fit, tear off a sheet and place on the window. 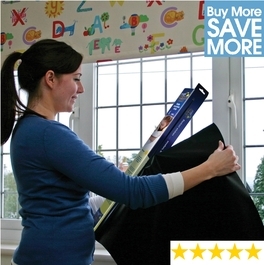 Magic Blackout Blind sheets are reusable (they last for months) and can be cut to size to fit any windows. Easier to fit than Gro Anywhere Blackout Blind, no suckers and fits exact size of window. Magic Blackout Blind is a kids and children's blackout blind. Magic Blackout Blinds stops ™ all light even round the window edge to darken bedrooms. Voted best blackout for windows.